Prominent & Leading Manufacturer from Chennai, we offer precision loop calibrator and pressure calibrator with integral electric pressure pump. With the help of our state-of-the-art infrastructure unit, we are able to manufacture and supply the superlative quality of Precision Loop Calibrator. Our offered loop calibrator is manufactured using supreme quality components and ultra-modern technology in adherence with industry norms. Designed to calibrate a broad spectrum of instruments from moving coil meters to process control systems, this calibrator is checked on different parameters under the guidance of our quality examiners. Being a highly effective, lean and fast-moving organization, we are highly instrumental in providing an extensive array of Pressure Calibrator with Integral Electric Pressure Pump. The offered pressure pump is manufactured using superior quality components and progressive technology in line with industry norms. 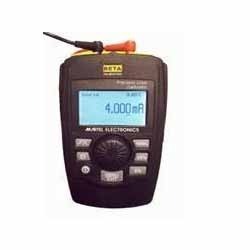 It allows you to power your transmitters and measure the common mA or V output signals precisely. Apart from this, provided pressure pump is applauded in the market for its easy installation.